Cute and amusing are the perfect description of Nibblers APK 1.16.0. In a fruit-based game, you will always stay amused as you play this puzzle game. The story begins as the fruit party happens around the garden, but the reptilians aren’t happy with the party. As the reptilians commence war to the fruits, it is your job to clear the field away from the reptilians with the power of the Nibblers. By controlling the aquatic creatures known as Nibblers, you will fill the field with steady amount of fruits and kick the enemies away. The humorous and fun gameplay of Nibblers will quickly capture your heart. 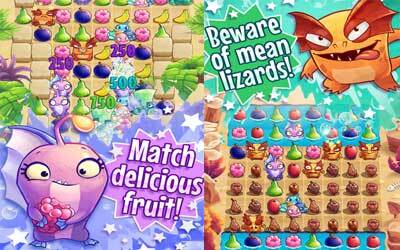 In this game, you will solve the puzzles by matching three, four, or more fruits of the same kind. With the different styles and strength of the Nibblers, you can use the special power to capture more fruits, take out the obstacles on the field, and kick the lizards out of the field.